Search here for villas and apartments for sale in Elviria Marbella. Elviria is located east of Marbella , a priviledged part of Marbella close to the Beach with a lot of amenities. 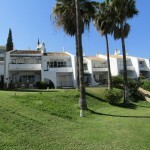 Elviria is located about 15 minutes east of Marbellas city centre and is approx. 25 minutes from Malaga airport. Elviria has long been a popular holiday resort and is home to the five star Don Carlos Hotel and to the internationally reknowned Santa Maria Golf & Country Club. It is less than 5 minutes drive from Cabopino port and there is no shortage of amenities. Most properties are within walking distance from the beach. There is also the English International School which caters for primary and secondary students. 10 minutes further inland from Elviria there is fantastic countryside with amazing sea and country views from the La Mareina urbanization. Elviria is perfectly situated and is within easy reach of any of the facilities you might require on the Costa del Sol. Eliviria is one of the many recent beach side residential developments along the Costa del Sol , which are all linked by the N340 coast road. The beaches in Elviria are often said to be the best in Marbella (municipality) and most properties on this housing development have been built within easy walking distance to the beach.it has facilities such as restaurants, town hall, post office, shopping centre, entertainment and sport. Only two kms along the N340 can be found the Hospital Costa del Sol (national health equivalent) and there for people looking for a permanent family base. There are excellent public and private schools in the area, catering for both primary and secondary students.The most notable hotels in the area are the five stars Don Carlos and Los Monteros Hotel and Four Seasons Country Club, which have all the amenities you would expect. However, the Don Carlos appears to be geared towards corporate use. The Los Monteros Hotel has Jazz jam sessions on Friday and Saturday nights, which is one of the few places that you can hear international live music in the Marbella area, apart from Puerto Banús. The area is popular with the golfing community as there are two golf courses located within Elviria; Santa Maria Golf and Santa Maria . Also within close proximity, there is the Marbella Club, Golf Rio Real and Cabopino and there is a tennis club in the community.